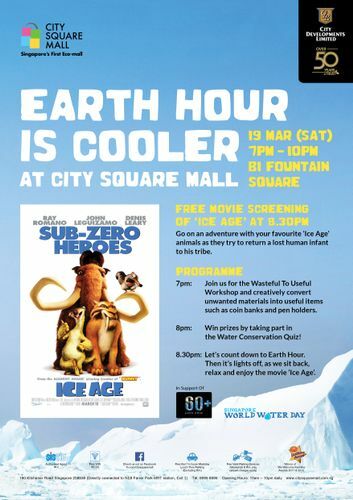 This year, City Square Mall will commemorate Earth Hour with the community through fun and educational activities catered for all in the family at Basement 1 Fountain Square. From 7pm onwards, the public can engage in creative fun by turning recycled materials into useful items such as coin banks and pen holders. They can also participate in stage games, where they would be tested on their knowledge about water conservation. These activities aim to highlight the severity of climate change, as well as educate the public on the importance of recycling and water conservation. As the lights go out at 8.30pm, families will be treated to an outdoor screening of Ice Age at the Basement 1 Fountain Square. Join the team of sub-zero heroes as they band together to save a human infant, during a time when the Earth was overrun by freezing temperatures that sent all manner of critters scattering in the path of encroaching glaciers. Instead of throwing away old and unwanted materials and items, participants can use their creativity and turn them into useful items such as plastic bottle coin bank and toilet roll pen holder. Take part in the Water Conservation Quiz and win prizes sponsored by Public Utilities Board. Countdown and lights off for Earth Hour. Sit back, relax and enjoy Ice Age.